The Delta Children Archer 4-in-1 Crib can grow with your child. It starts as a crib, and then can be converted into a toddler bed. When your little one has outgrown the toddler bed, you can then transition this bed into a daybed, then finally into a full-sized bed. The crib dimensions are: 55.75”(W) x 43.75”(H) x 30.50”(D). The weight of the crib is 68.8 pounds. The maximum weight for this crib is 50 pounds. The arch-shaped headboard has a three-position mattress height adjustment. Some parents liked to lower the crib as their babies grew. 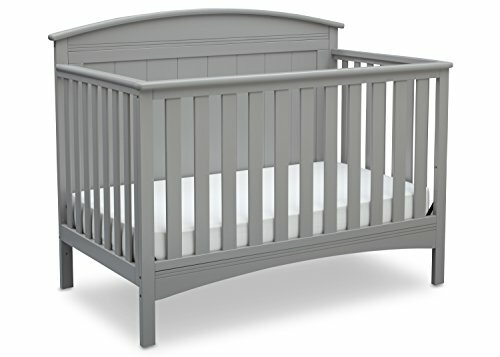 As with most cribs on the market, the Delta Children Archer 4-in-1 Crib sells the mattress separately. When picking out a mattress, make sure to get one that will fit this crib snugly. Do not skimp by accepting a hand me down or garage sale mattress that does not fit tightly. Even the smallest gap between the crib sides and mattress, can pose a severe safety hazard for your baby. This crib is JPMA certified and and has tested at the highest category standards established by ASTM through annual independent laboratory testing. The Delta Children Archer 4-in-1 Crib has passed all safety standards. It has been tested for lead and other toxic elements that meet or exceed government and STTM standards. You can sleep soundly knowing your baby is also safe while he or she sleeps. Pull-out drawer with wheels that offer under crib storage. According to parents, this crib is very easy to put together. When directions are hard to understand or pieces are missing, parents are quick to comment so that others can be forewarned. But with the Delta Children Archer 4-in-1 Crib, parents had high praises for the ease of assembly. "This thing looks even more chic than you can appreciate in the picture. Very sturdy and well built. Classy piece that can fit into various color schemes. Reasonable price tag. Would definitely recommend." This is a low priced crib, but it's not the lowest out there for a conversion crib. And keep in mind that you have the option of using this bed for all stages of your child's development. In the long run, parents who buy and use conversion beds, save a lot of money. "Sturdy, good directions, and better quality than the cribs in the store in my opinion." Most of the comments were a reflection of what this parent said. "Okay, first off... get the right size mattress!! I had TWO toddler/crib standard mattresses and NEITHER ONE FIT!! Apparently this crib is a bit roomier than I am used to. THE CRIB MEASURES 52-1/8" from side to side, and 27-1/2" from front to back, inside measurements. You only want to have a gap of two fingers max so keep that in mind when you pick out the mattress. Especially since I don't use a bumper anymore this is critical... this crib only has a metal mesh and frame on the bottom. So any gaps are direct air gaps. Not a problem with a perfect mattress though." I put together what I thought were the main points of the Archer 4-in-1 Convertible Crib from Delta Children. I hope this helps you in your search for a baby crib. In my opinion, this is a good crib at an average price for what's included. It has met all of the safety standards and it's stylish in a simple kind of way. I like that it will transition from a crib to a toddler bed, daybed, and then an adult-sized bed. To read all our baby crib reviews, check out our article, The Top Ten Baby Cribs of 2018.